Consulting Services | Wolverine Fire Protection Co.
Wolverine Fire Protection Co. offers a variety of fire protection engineering and consulting services direct to utilities, AE firms, construction companies, and EPC joint ventures. We are experienced with NFPA 850 Design Basis Documents, Fire Risk Evaluations, Site Assessments, Alarm/Detection System design, Suppression System design, Water Supply System design, and more. Wolverine’s work frequently places us in the position of working in and around existing conditions and finishes, including those within historical settings. Our teams have experience with preservation, rehabilitation, restoration and adaptive use in support of our client’s historical social and economic goals. We recognize our responsibility, as a nationwide Fire Protection service provider, to conduct our operations in a manner that is environmentally responsible. We will continually strive to exceed our client’s expectations, while promoting efficiencies that lower the overall impact on our environment. 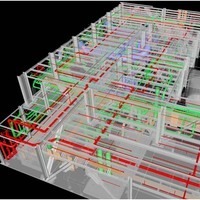 Wolverine has found the BIM practice invaluable in our approach to design. Wolverine routinely prepares all design drawings in a comprehensive virtual manner as a matter of internal quality control and coordination. 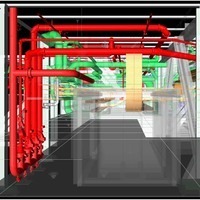 We’ve found that when all parties involved in a project can visualize and evaluate a virtual model of the space, it reduces time, minimizes change orders, and greatly enhances the functionality of the finished project. We currently design our documents in the latest versions of AutoCAD, and AutoSPRINK, and coordinate with other disciplines through NAVISWORKS.